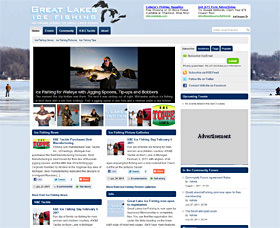 AnglerHosting.com grew out from our love of working on outdoors-related website like our first community site started in December 2005 by owner Dan Kimmel – GreatLakesBass.com (GLBass). As more bass anglers found GLBass, we moved to bigger and faster servers to provide the best possible experience for fellow anglers and those interested in Great Lakes bass fishing. From there, we branched into building more outdoors websites such as GreatLakesIceFishing.com and KentuckyLakeBass.com, and then began building websites for other outdoors persons and businesses, and even non-outdoors persons and businesses such as Bakenista.com – a new website that’s about baking with style. We enjoy designing, building and maintaining websites so much, we started AnglerHosting.com to help share that enjoyment. The World Wide Web keeps growing, changing and getting better-looking for the individuals, groups, businesses, tournament anglers, churches who are most successful by providing the experience website visitors expect. That’s where we can help you with a great looking, functional website that visitors and customers can find. We’ve learned quite a bit about building websites for specific needs and goals along with critically important things for success like search engine optimization. We can design a website for you. We can design your logo, your graphics. We can add new features, perform installations and upgrades, give you a website you can update and maintain on your own, and we can even maintain it for you so you can concentrate your efforts and time where you believe it does you the most good. Of course, we can host your website too and even find you that perfect domain name. We can help promote your website. Let AnglerHosting.com put you on the Internet and World Wide Web with a modern-looking functional website that your visitors can find and want to visit. Let AnglerHosting.com put you ahead of the curve whether you need a few pages, a forum, a blog such as WordPress or a combination of features. Contact us. Check out some examples of websites we have built for our own network and for others – portfolio samples. For a more complete list of available services we can provide, please visit our Services page. For starting pricing and more information, visit our Price List. Many of our services require basic information from you so we can provide you with a reasonable quote. Contact us if you aren’t sure we provide what you need or to ask any questions you might have.